Anthony Wayne was a United States Army officer and statesman. 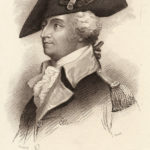 Wayne adopted a military career at the outset of the American Revolutionary War, where his military exploits and fiery personality quickly earned him promotion to brigadier general and the sobriquet Mad Anthony. He later served as the Senior Officer of the Army and led the Legion of the United States. Born in Chester County, Pennsylvania, Wayne worked as a tanner and surveyor after attending the College of Philadelphia. "I shall begin my march for Camp tomorrow morning. It was not in my power to move until I could procure shoes for the troops almost barefoot."